Amritsar Town Hall will soon get a Lahore-like food street for connoisseurs to relish local varieties, offering unique and aromatic flavours that will attract visitors from around the world. The suggestion came from Punjab Chief Minister Captain Amarinder Singh during a visit to the Punjab Food Festival, organised by the Dainik Jagran Group, here. With Amrtisar, the Guru Ki Nagri, being a major tourist destination, a Food Street of Punjab’s cuisine would be a major added attraction for visitors, said the Chief Minister, directing Tourism and Culture Minister Navjot Singh Sidhu to work on the project. Sidhu promised to commence work on it on priority and announced that the food street will come up at Town Hall within six months. Speaking on the occasion, the Chief Minister also assured all government support to noted actor and producer Deepa Sahi, who comes from an Army background, for the development of the historic Gobindgarh Fort, which was opened to the public exactly a year. Deepa has been working at the 18th century Fort for the past few years to develop the region’s first virtual reality theme park for bringing alive the experience of the past. The government will join Deepa in further nurturing and evolving the unique live museum, which has emerged as a repository of Punjab’s history, said the Chief Minister. 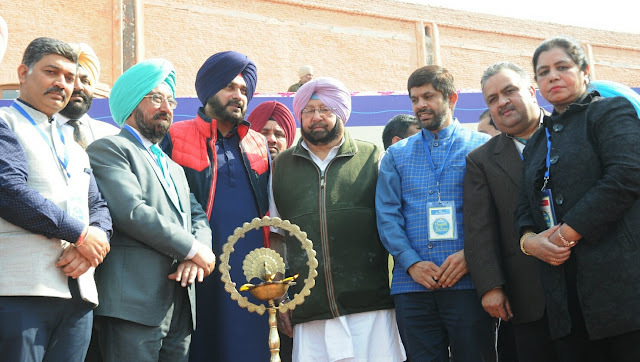 Prominent amongst those who were present on the occasion included Local Government Minister Navjot Singh Sidhu, Media Advisor to CM Raveen Thukral, MLAs Sukhbinder Singh Sarkaria, OP Soni, Dr. Raj Kumar Verka, Inderjir Bolaria, Harpartap Ajnala, Harminder Singh Gill, Santokh Singh Bhalaipur, Tarsem Singh DC, Sunil Dutti, Sukhwinder Singh Danny, Dr. Dharamvir besides District Presidents of Congress Unit Urban Yugal Kishore and Rural Bhagwant Pal Singh Sachhar. Apart from these from Dainik Jagran Group North India Editor Meenakshi Sharma, Resident Editor Amit Sharma, Editor Punjabi Jagran Varinder Singh Walia and Chief General Manager Mahinder Kumar were also present.